You can get lead poisoning if you do not take care when you remove lead-based paint from the inside or outside of a building. Children, especially pre-schoolers, are particularly at risk from lead poisoning because they may swallow bits of paint that contain lead or soil that has been contaminated. Children chewing on painted cots or toys are also at risk if lead-based paint has been used. Until 1965, many paints on the New Zealand market had high lead levels. This was particularly true of pre-1945 paints. Even if a building has been recently painted, it may have been painted with lead based paints or have layers of old paint covered by modern paint. Today only special purpose paints contain lead and these are clearly labelled. During pregnancy, lead may cross the placental barrier from the mother to the baby. Some evidence suggests that elevated blood-lead levels in the mother might affect the development of the nervous system of the baby and might increase the risk of a premature birth. It's not possible to tell lead-based paints by their appearance, but there is a simple test that can detect whether the paint is a health risk. You can purchase a lead based paint test kit from your local Resene ColorShop, or take in a flake and Resene ColorShop staff can test it for you. If a building was built and painted prior to 1970 it is best to presume that it has been painted with lead-based paint. Contact a Health Protection Officer in your local area if unsure. Many adults and children with lead poisoning will have either very vague or non-specific symptoms such as stomach pains, difficulty sleeping, constipation and loss of appetite or no symptoms at all. If a child has more severe symptoms such as weakness or difficulty walking, seek urgent medical attention. Untreated lead poisoning in both adults and children can be fatal. Pets often show symptoms of lead poisoning before people. If a pet is unwell and lead poisoning is diagnosed, a doctor should check all members of the household. The removal of lead-based paint can result in harm to both the people doing the job and the people who live or work nearby. Untreated lead poisoning can lead to brain damage or even death. Lead is a health hazard. Small chips of lead containing paint or lead paint dust can create health risks. It can also contaminate the environment. Home renovators often unknowingly create hazards. Fine lead-based paint particles deposited in soil or household dust can become a constant risk to the health of young children, other household occupants and pets. Lead enters the body as lead containing dusts (produced by sanding or by disturbing flaking or chalking lead-based paint) or lead fumes (produced by heat and burning). If you think a child may have been exposed to paint dust, flakes of old paint, soil with paint dust in it, or may have chewed on some old paint, you should ask your doctor to check the child's blood lead level. Keep children and pets away from the work area and make sure they don't eat or play with paint debris. If removing paint from the inside of your house, remove the curtains and furniture from the room and cover the carpets before beginning the job. After sanding, wet wipe surfaces to remove dust then use a commercial vacuum cleaner fitted with a suitable dust filter. If removing the paint from the outside of a building, make sure all windows and doors are closed to prevent contamination inside. Collect all paint debris on a ground sheet large enough to contain all the debris. If working on a scaffold, tie a sheet underneath to catch falling paint. If removing paint by waterblasting, try to collect all flakes of paint from the surrounding area. Clean the area around the groundsheet with a vacuum cleaner to collect any other paint debris. Dispose of the contents immediately. After sanding, wet wipe surfaces to remove dust and then use a commercial vacuum cleaner fitted with a dust filter. 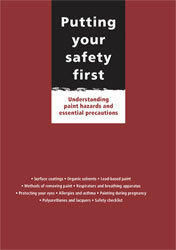 Do not burn paint debris or timber that is coated with paint containing lead. Wrap up all paint debris securely in heavy-duty plastic bags. Provide short-term secure storage for debris. Contact the local Council before work begins. Paint wastes must be disposed of in accordance with local Council requirements. Wash your face and hands carefully before eating food or smoking and change out of contaminated overalls (especially if dry sanding) when not actually working. Wash contaminated clothes separately. Wash your face and hands and change out of contaminated clothing before handling children. Wear a hat or cover your head (especially when dry sanding) to prevent dust accumulating in your hair. The quality and efficiency of safety equipment needed to make dry sanding of lead-based paints safe generally means that dry sanding is not possible, or recommended for use by the DIY'er. Wear a good quality, properly fitted toxic dust respirator when dry sanding, making dust, or burning off lead-based paint. If using a disposable type, only those with double headstraps are suitable. Respirators should meet the requirements of the New Zealand/Australian Standard NZS/AS 1716-1991 (Respiratory Protective Devices). Do not smoke while removing paint as hand to mouth contact may increase the risk of eating or inhaling lead paint dust. If safety precautions haven't been taken, soil may be contaminated and the top layer may need to be removed. Vegetables and fruit grown in soil contaminated by lead-based paint are currently deemed safe to eat as long as they are carefully washed to remove dust and soil from the leaves on the outside of the plant. The 'Health and Safety in Employment Act' requires employers to provide a safe working environment for employees. Employees and self-employed people are also required to protect themselves and others from harm. This includes contractors. For further information on lead poisoning contact your local Health Protection Officer.